I headed over to BARCS this morning to walk dogs for a few hours. I was really happy to see that several of the dogs I’d walked on Thursday had already been adopted, including Henne, Misty, and Coraline. There were a bunch more new “adopted” or “adoption pending” cards on the kennels, so I guess a lot of people had been in on Friday. There were lots of other volunteers there, and lots of adopters coming in and out, so it was busy but good. 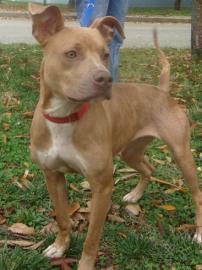 I played with Baby again, the little fawn colored pitbull girl, and she was just as sweet and cuddly as ever. Josie, another small pitbull girl was a little bit less shy of me this time but still unsure about the outdoors and the other barking dogs. I saw some adopters looking at Snow, the small all-white pitbull girl, so I hope she will be adopted. This entry was posted on Saturday, November 28th, 2009 at 3:38 pm. You can follow any responses to this entry through the RSS 2.0 feed. You can leave a response, or trackback from your own site.